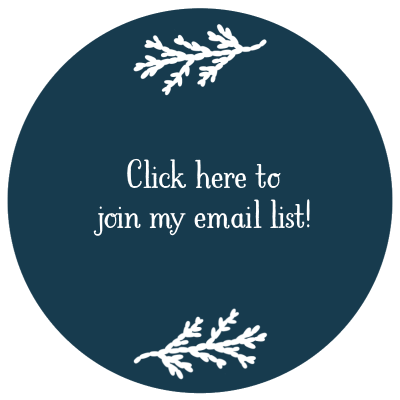 Here is where you’ll find some patterns I’d like to share with you! Click on the Ravelry buttons if you’d like to see how other knitters made out with the pattern. I haven’t crocheted in a very long time, but I love this scarf. It will go on my project list PRONTO! Thanks for sharing the beautiful pattern. Of course!! You could use anything really, but if you use a worsted weight for example, you’d want to cast on more stitches. The pattern is multiples of 11, so you’d have to judge how many extra pattern repeats you’d need. Just started the scarf and having only recently learned how to crochet I can’t believe how easy it is and how fast it’s coming together. So beautiful. Thanks for posting this pattern! hiii…i love love love your chunky lacy cowl…could i please have the pattern!? thank you. Yes! Thank you for having exactly the right cowl pattern for my current attention level/yarn stash! Thank you! roving in subtle shades of pink and mauve instead of Thick & Quick and it came out great. So excited to have run across this pattern. 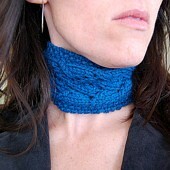 Just bought some beautiful aqua roving and was looking for a lacy cowl to make. I would love it if you would send the pattern. 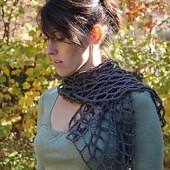 I would love to try the chunky lace cowl. Could you send me the pattern. I would like to make the chunky lace cowl and would be grateful if you could send me the pattern. Hi, I fell in LOVE with your chunky lace cowl, could you send me the pattern? Hi Heidi,Love your chunky lace cowl and would like to make it for my daughter.I live in New Jersey and can not find the 13″ 18″ long needles anywhere.I tried Joanne”s, Michaels and AC More and none of them carrie that size. Only 13 and 29 inches long nothing smaller. What brand needles did you use. I am a beginner knitter. Any help or advise would be greatly appreciated. Just love this pattern. I may have to put this on my list of Christmas gifts to make – Very Nice! Do we have permission to sell finished items made from your patterns? Hi, sorry for the delay in responding. No, as with 99% of the patterns out there, mine are for personal use only. Thanks for asking! Hi Heidi, thanks for the lovely patterns. I’ve added them to my list of links at http://www.knittingpatterndesigns.com/index.php/free-knitting-patterns. I would love to have your beautiful chunky lacy cowl pattern and leg warmer one!! Thanks!